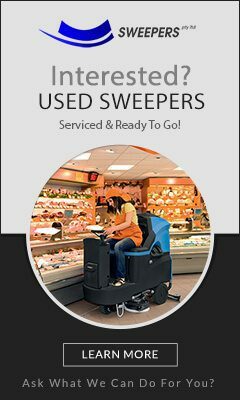 If your looking to purchase Used Sweeper Machines and would like to make sure you are buying your Used Sweeper Machine from a reputable company. With Sweepers PTY LTD you can rest assure that you are dealing with an experienced and professional company that has taken care of the Sweeper Machines and maintained them to the highest standards. Sweepers PTY LTD offer some of the best sweeper machines at some of the best prices, so keep your eye out for sales and promotions on new and used sweeper machines to get yourself a real bargain. Used Sweeper Machines we sell have been fully services prior to being shipped to your door. If you are looking to save a few dollars and still get yourself a great quality sweeper or scrubber machine. Browse our Used or Second Hand commercial cleaning equipment now. If your looking to buy or sell sweeper machines or scrubber machines, get in touch and chat with us today! Let Sweepers pty ltd deliver your new sweeper machine or scrubber machines Australia wide to your door.